Parque Colon in Santo Domingo seems to have it all--an exemplary urban designer's case study! It's a finely proportioned open space, ringed by fine buildings and anchored by a magnificent church. Beautiful trees provide shade, color and a sense of scale. 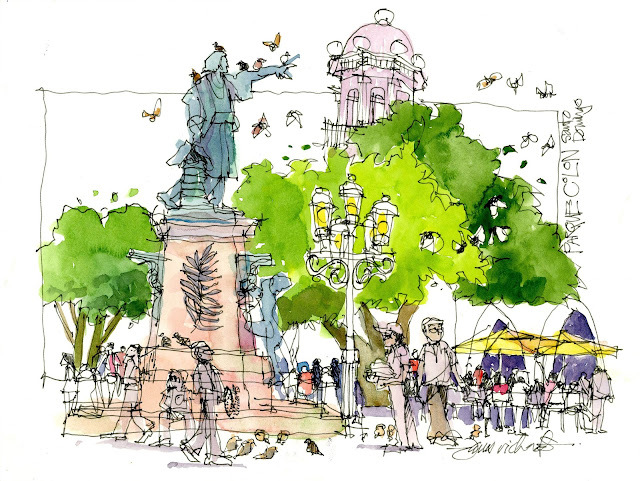 The sculpture of Columbus and its pedestal function as art that doubles as seating for people watchers. There's a selection of sidewalk cafes and benches at the edges for eating, drinking, seeing and being seen. The open areas, shaded areas and cafe tables offer plaza patrons varied experiences and the all-important aspect of choice. The one classic feature that seems to be missing is water in the form of a pool or fountain, though that doesn't seem to inhibit the park's use in the least. It seemed full of both locals and tourists, even in the heat of the day. I've seen contemporary plazas costing millions in cities all over the world that aren't nearly as loved or used. I created this sketch quickly during the Sketchcrawl as a donation for the Urban Sketchers silent auction. I'm honored that it now lives with Shari Blaukopf! Lucky Shari! This one's a beauty. Thanks Ronnie! I came up with "Freehand Renaissance" as the title for an article I wrote for Landscape Architecture Magazine a while back, discussing how the over-saturation of digital imagery and working methods was giving rise to a resurgence in need and demand for rapid freehand sketching in the design studio. I later used it as the theme for my lecture at the USK Symposium in Lisbon. I wish I had seen and heard your lecture. Have you read The Craftsman? Great book, that I think you'd enjoy. Thanks Ronnie; you'd have enjoyed the lecture, I think. I just read the introduction and conclusion of "The Craftsman" on Amazon, and then bought it for the Kindle. Looks very intriguing. I was struck by a line in the conclusion: "Work which remains permeated with the play attitude is art." It reminded me of a line I wrote for the first chapter of my book: "What I've learned is that it's not only okay, but important for creative professionals to adopt attitudes and working methods that integrate work and play within an ethic of discipline and professionalism." Okay, my line is kinda wordy, but I can tell I'll enjoy reading The Craftsman. Thanks for the recommendation. You are so right. City planners, and those who pay them, just need to spend a couple of days sitting in that plaza to get it. I remember this sketch, good for Shari! Love your sketches. 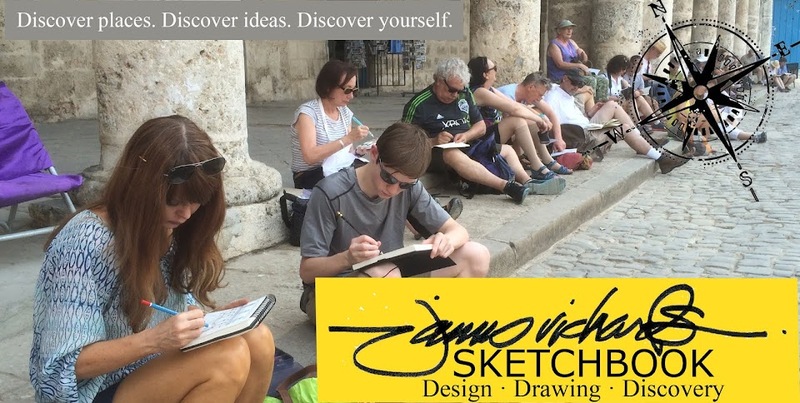 I really enjoyed our chat as we sat at the back of the cathedral and quietly sketched... while most of our group was escorted out! I loved your thoughts on kids and dreamers and the fact that you encouraged your children to pursue their dreams to the fullest. I will always remember that conversation! On an urban planning note... if you every get a chance to come to Cincinnati please stop by Washington Park in the Over-the - Rhine area. It has been exciting to witness the changes to this area. It has of course come with some criticism, but to save a beautiful historic park is nice to see for our city. Polly, great to hear from you! Meeting you and Hannah was special, and I too really enjoyed that conversation. Traveling with my kids as they were growing up gave us so many shared experiences, and I know you and Hannah will treasure your memories (and probably plan many more adventures in the future). I checked out Washington Park online. It looks like a great success story; I'm sure I'll be reading about it in the design press in the coming months. Hope we cross paths and sketch together again. I am honoured to have this sketch on my wall. It just came back from the frame shop and I have to find the right spot for it. It has such meaning for me Jim. It brings back wonderful memories of the people I met in Santo Domingo (including you!) and all that I learned from five different and amazing workshops. So much creative energy and excitement over those three days I was so lucky to be part of it. It's my honor, Shari. I'm looking forward to our paths crossing many times in the future, and to sketching with you again. What a great way to see and value the world!